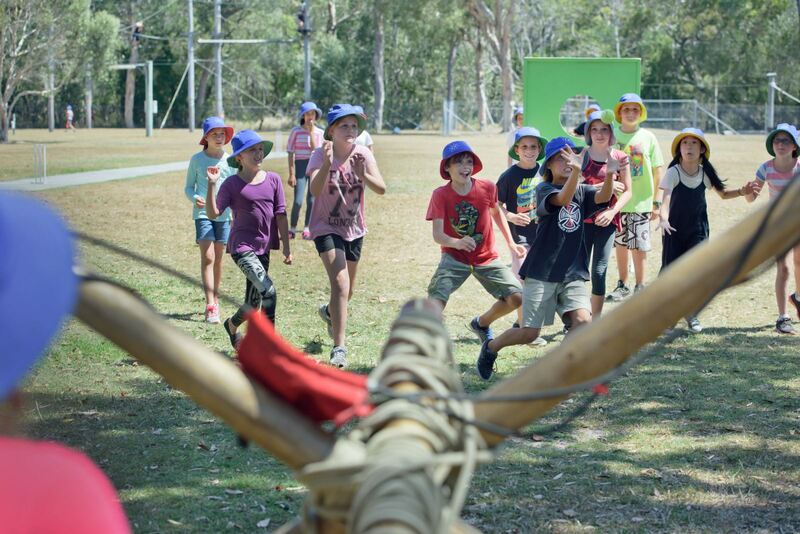 Apex Camps Sunshine Coast offers more than 30 awesome outdoor adventure activities for you to choose from! Take advantage of our beach-side location with an Inflatable Water Park, Surfing, Stand Up Paddle Boarding, Raft Building, Canoeing, Beach Games and more! Or step outside of your comfort zone on our Low, Mid or High Ropes Courses and Flying Foxes, or our 12-meter high Rock Climbing Tower! 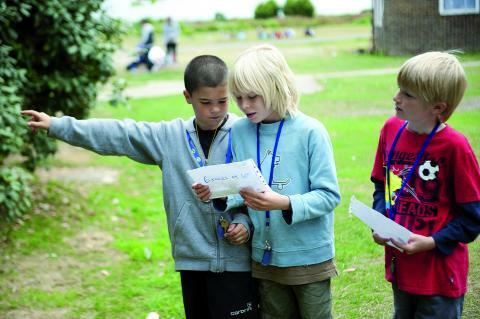 Other popular activities include our Mud Pit Challenge, Archery, Fencing and Catapults. We also offer a great selection of supervised night programs to keep the kids entertained all evening. With fully qualified, accredited and experienced activity staff, our activites are exciting, fun, safe and sure to engage everyone. Each activity session is 1 hour and 50 minutes, with the exception of night activities (1 hour and 30 minutes). 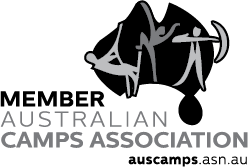 Total of up to 8 activity sessions plus 2 supervised night activities over a standard 3 day/2 night camp (for day visits, up to 3 activities). Having trouble deciding on a suitable activity program? Let us help you tailor a program to suit your desired outcomes.  Risk assessments for each activity, and waivers for our inflatable water park and wake park, are available here. 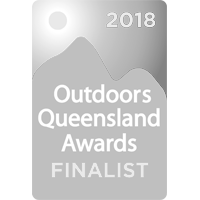 Experience abseiling on the biggest outdoor abseiling tower in South-East Queensland. The tower features two levels, allowing younger participants to 'rappel' from a lower height should they choose. This confidence building activity is easily accessed by an internal ladder system in complete safety. A fun and memorable heights experience! *Best suited to ages 8 and up, however 5-7 year olds who aren't comfortable may simply climb part of the rock wall and do a descent. 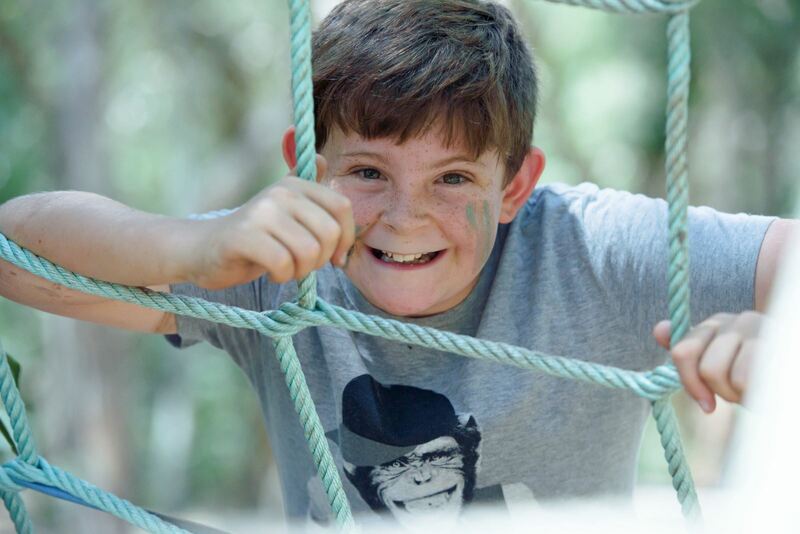 Great for personal growth and partner work, the unique design of our 1.5 metre high mid-ropes course allows individuals of all ages and abilities to take part. Participants can also experience the flying fox, a guaranteed highlight of the activity. *Best suited to ages 6 and up, however confident and/or tall 5-6 year olds are accommodated for. 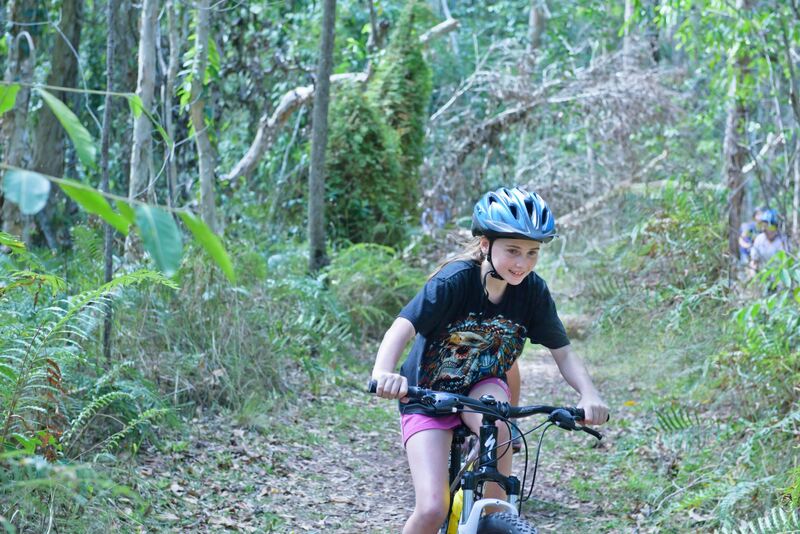 Ride through picturesque bush trails directly from the camp, through to breathtaking coastal scenery all under the guidance of excellent instructors. Multiple route choices and good quality bikes of all sizes enable all ages and skill levels to participate in this activity. 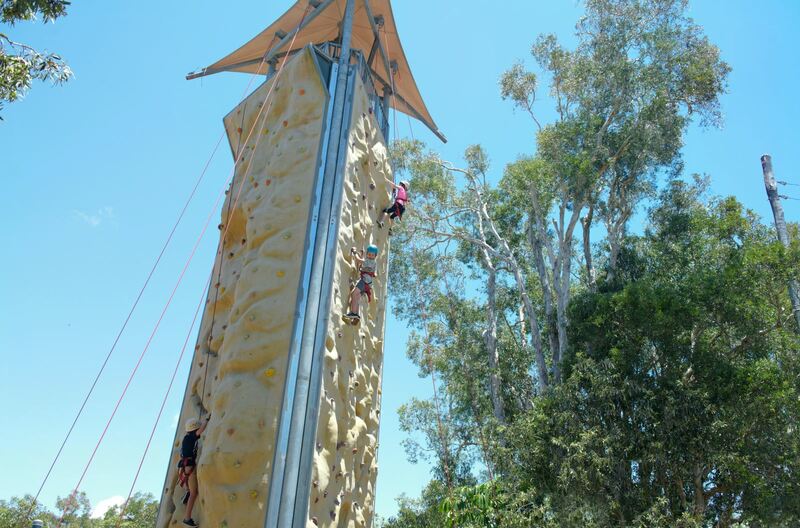 Climb to new heights on the largest outdoor rock climbing tower in South-East Queensland, an impressive 12-meters high! This activity caters for beginners to expert climbers, with eight different climbing routes depending on the participant’s ability. Our qualified instructors will give climbers tips and techniques to ensure they get the most out of the activity. This activity offers the opportunity to learn new skills, develop an understanding and appreciation of rivers and their surrounding environments, and to have a lot of fun doing so! 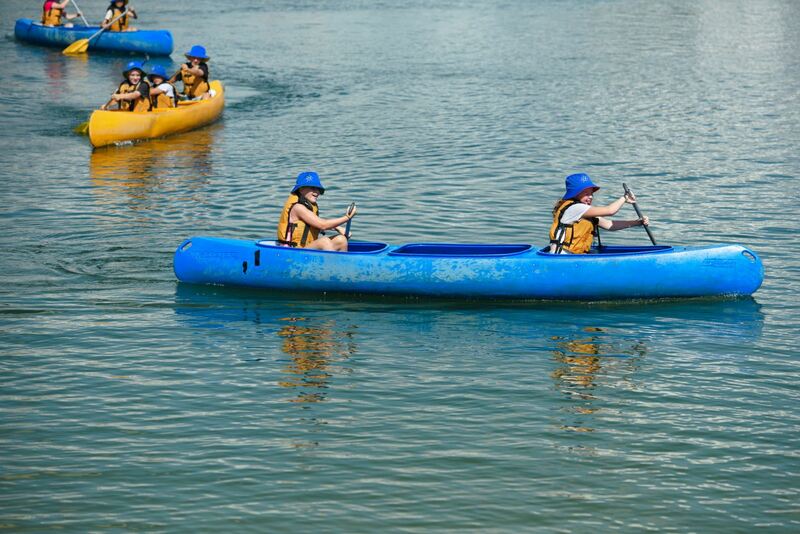 Canoeing encourages the development of communication skills and teamwork. It can be successfully mastered by participants of all ages. This session is conducted on the Maroochy River, a short walk from camp. Note: This activity is not able to run on weekends. Participants are not required to be able to swim. 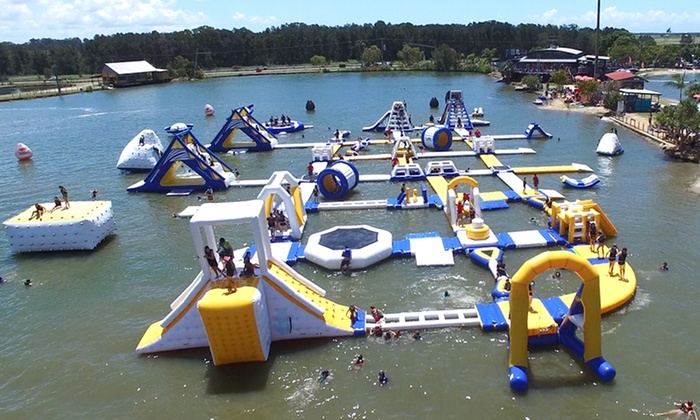 Extreme levels of fun are to be had at the nearby inflatable water park. Come together as a group in an exciting and interactive way, with spills, thrills and laughter inevitable in a safe and fully supervised water environment. The activity makes use of inflatable obstacles, slides and jumps - it's sure to be an absolute favourite for the group! Note: Run as a whole group activity. ^Additional waivers are required for use of the park. *Participants must be aged 6 and up and able to swim. A fabulous camp activity for the more adventurous! 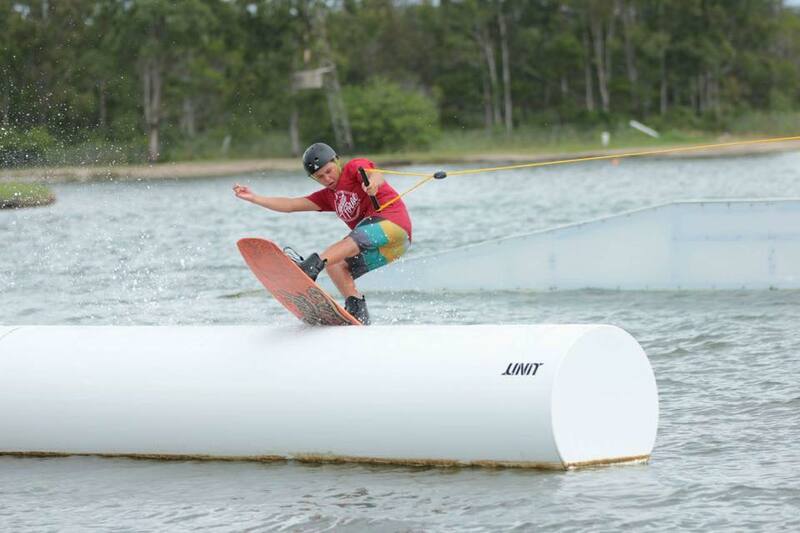 Held at the nearby wake park, wake boarders can negotiate a series of obstacles, rails, kickers and jumps built in to the park, adding to their wakeboarding experience. Skis and kneeboards are also available. *Participants must be aged 10 and up and able to swim. This is a fun and often wet session, fostering group problem solving, team work, construction skills and a little friendly competition! 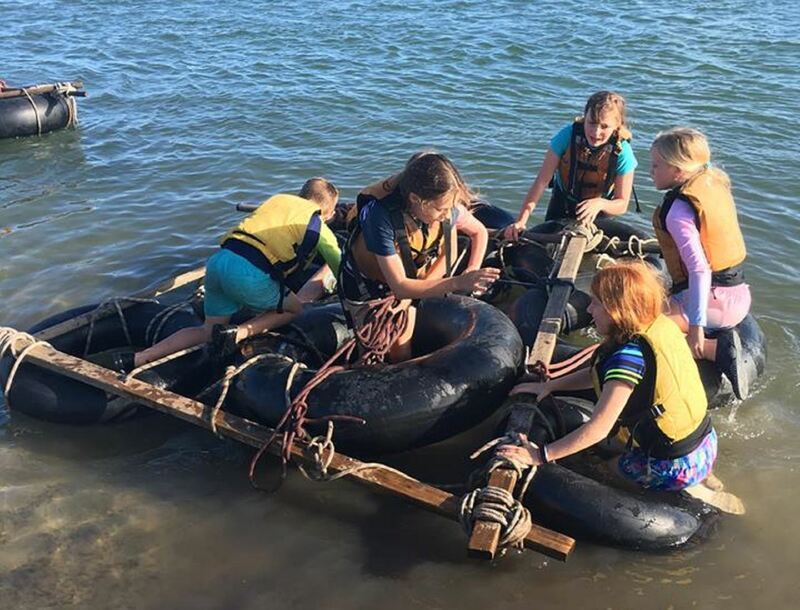 Participants construct rafts from resources provided, following basic knot tying and lashing instruction provided. They then complete set challenges using their vessels. This session is conducted on the Maroochy River, a short walk from camp. *Participants must be able to swim. Fencing provides a unique opportunity for participants to try their hand at a new skill. 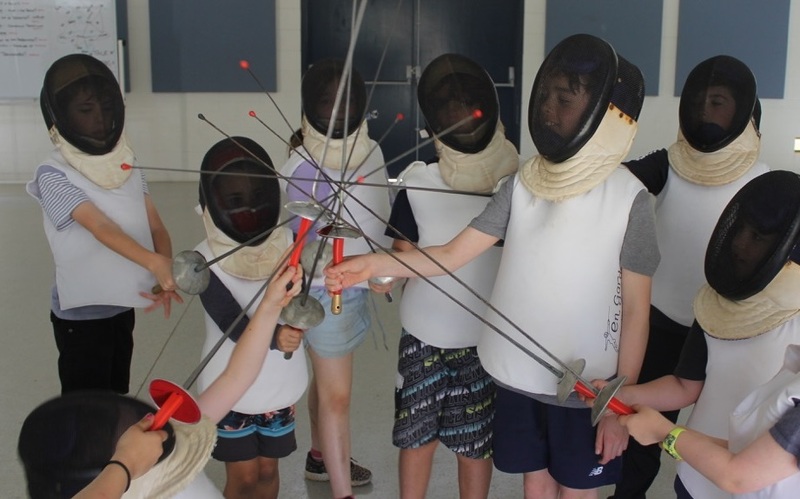 Under the supervision of a qualified fencing instructor and using the necessary safety equipment, participants learn the history of the sport, practice some fun pirate skills and take part in Olympic-style duals. To finish off, participants put their newfound skills to the test in fun team challenges. This is one of our most popular activities! 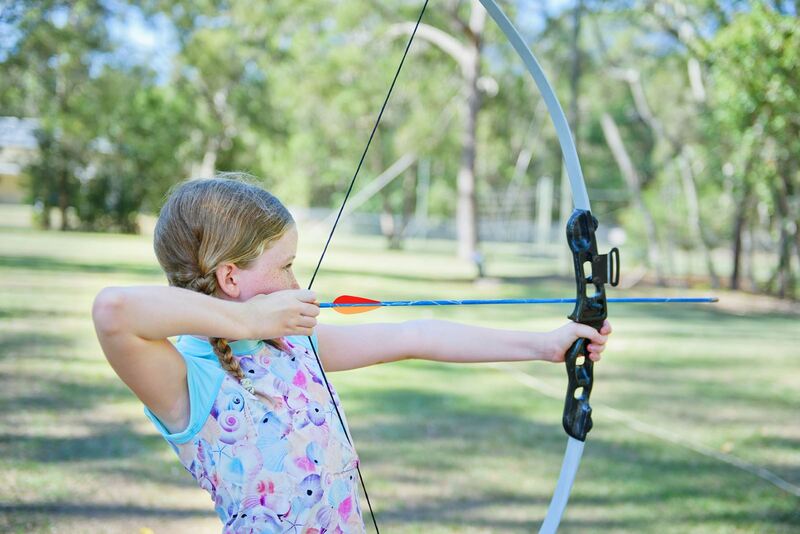 Archery can be enjoyed by all ages, abilities and skill levels, with bows designed for each individual age and ability fired towards the target under skilled supervision. This activity is sure to hit the mark. Designed for fun and laughter and guaranteed to wear energetic campers out. Games are tailored to suit the group’s age and program objectives, including traditional beach relays, competitions and much more. This activity is a must for those coming from non-coastal areas. Conducted at North Shore beach, approximately 25-minute walk from camp. Note: This activity is not able to run on Mondays or weekends. Does not involve free swimming, though participants may get wet during some games. Bush skills is a practical activity teaching participants skills and knowledge about surviving in the bush. It includes hands on activities such as fire lighting without matches, shelter construction, damper making, water collection and navigation. Incorporating a history in the use of catapults during medieval wars, participants are taught basic knot tying skills and design that enable them to build their own team catapult. They then shoot sponges at each other, testing out their skills and aim while other team members attempt to catch the sponges. Note: Young participants may simply make use of a pre-built catapult and the activity combined with another activity. 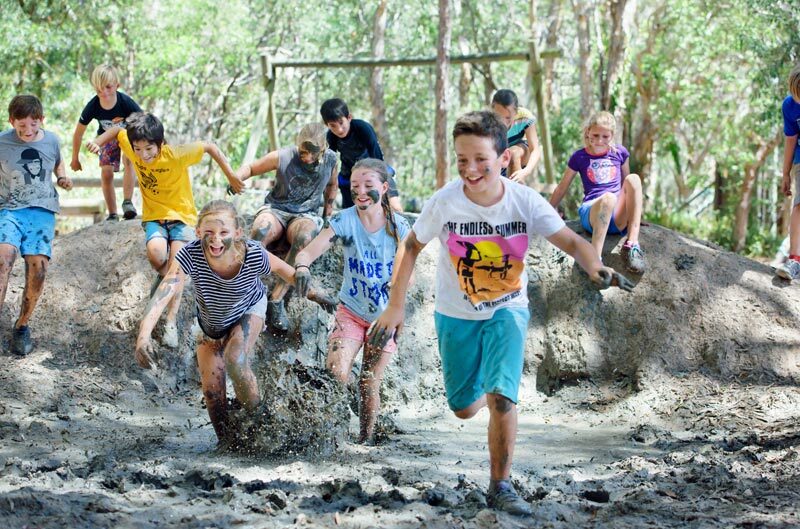 Our army inspired mud pit challenge course is the perfect activity for anyone with a sense of adventure and fun, and a willingness to get a little muddy! Incorporating team work and communication, participants work through various challenges including rope swings, cargo nets and tyres, all topped off with a fabulous, giant mud trench. 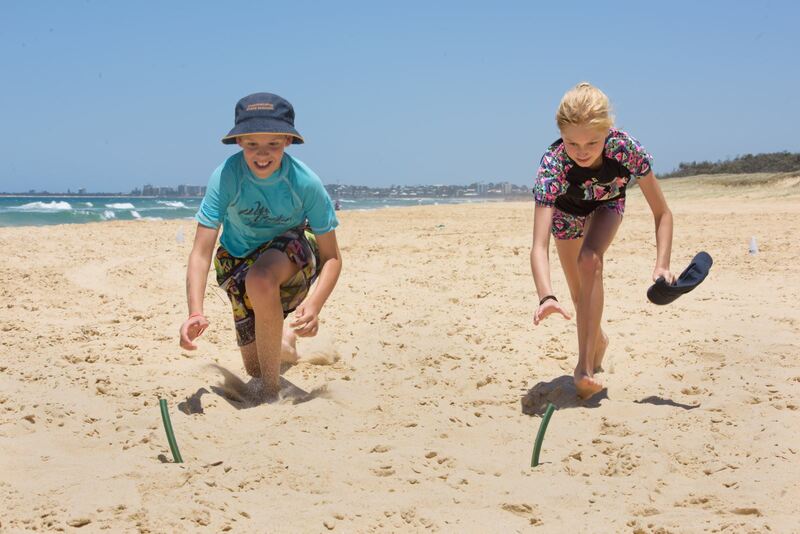 Fun sporting games that will have everyone challenged and smiling in a group setting. Held on the camp's large sports oval, activities can include volleyball, T ball, croquet, bocce, cricket and soccer. 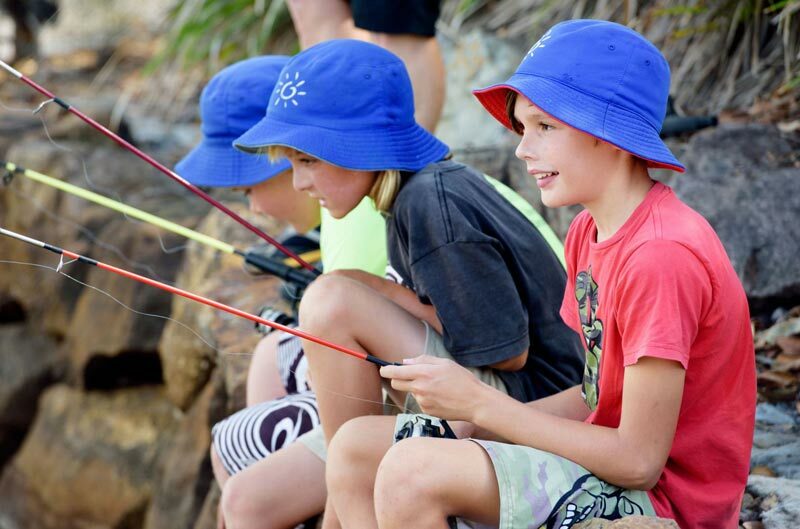 Enjoy a relaxing session on the banks of the Maroochy River wetting a line in the hope of landing that big catch! Cables, logs and ropes run between the trees, allowing participants to challenge themselves in different ways, all approximately 30cm off the ground. This activity relies on team trust which must be demonstrated ahead of the activity through a series of basic trust exercises. Participants do not require harnesses, therefore the use of spotting by team mates is a must. 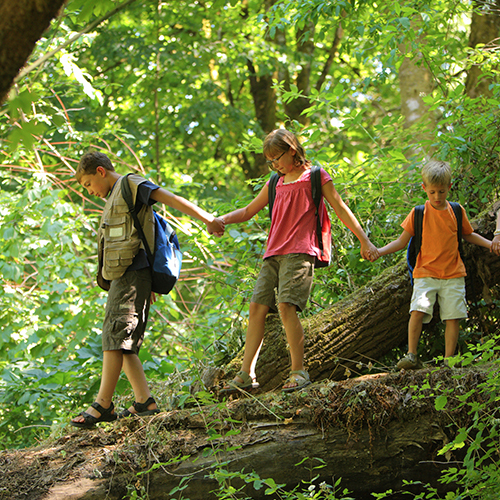 Hand out the compasses and we’re set for some fun! This session gets participants using compasses, recording data and working together as a team. It's sure to get everyone thinking and communicating effectively. *Best suited to ages 11 and up, due to the need to learn how to use a compass. This team based, competitive challenge focuses on communication, spatial awareness and group dynamics. 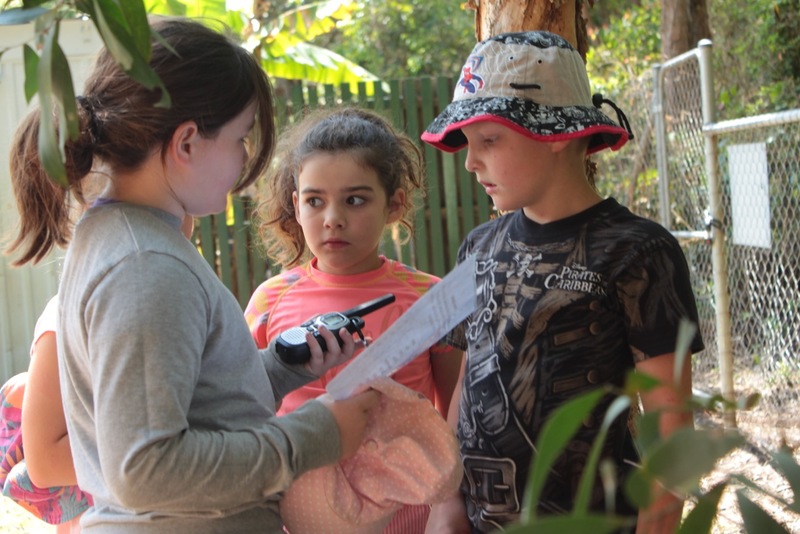 Participants are provided with walkie talkies and a site map identifying the location of a series of check points. Working together, each team must locate as many check points as they can within a given timeframe. Bonus points are earned by completing a radio based task at each check point, teaching basic communication etiquette (turn taking, listening skills, thinking before talking, being clear in communication). It’s also a lot of fun! Note: Can be completed as a night activity. 'Together Everyone Achieves More' as groups take part in (sometimes hysterical!) activity challenges such as completing the 'electric grid maze' and 'lava crossing'. Participants work together to negotiate solutions and make use of various equipment in order achieve success for their group. Team builders focuses on developing the 5 Cs of team functioning (Communication, Co-operation, Commitment, Care & Concern), with participants experiencing both physical and cognitive interaction. Our onsite multi-purpose court is great for team games including basketball, tennis and wall racquet ball. The court area can be quickly transformed for all types of court sports. Water based activities are always a favourite! 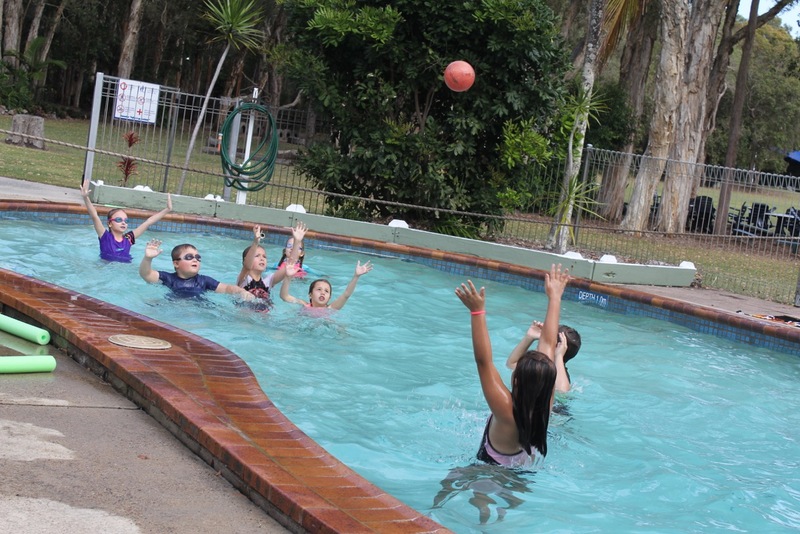 Our supervised pool games activity is enjoyed for its team challenges, fun games and just for cooling off! Games can include pearl diving, relay races, pool volleyball, marco polo and more. Note: Participants who are unable to swim may take part by staying in the shallow end of the pool. Round robin is the perfect way to get your entire group working together. 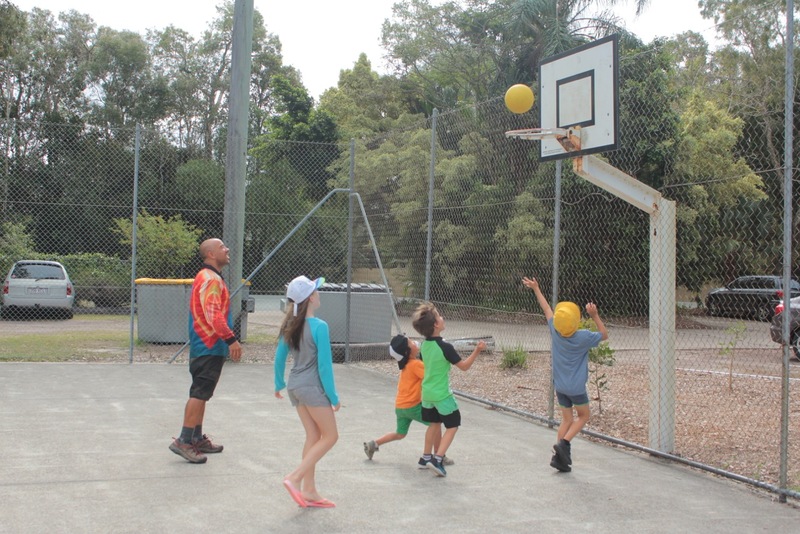 Participants rotate through action-packed team challenges and sporting games such as 'coconut toss' volleyball, rapid T-ball, multiball soccer and crazy cricket! Note: May be run as a whole group activity. 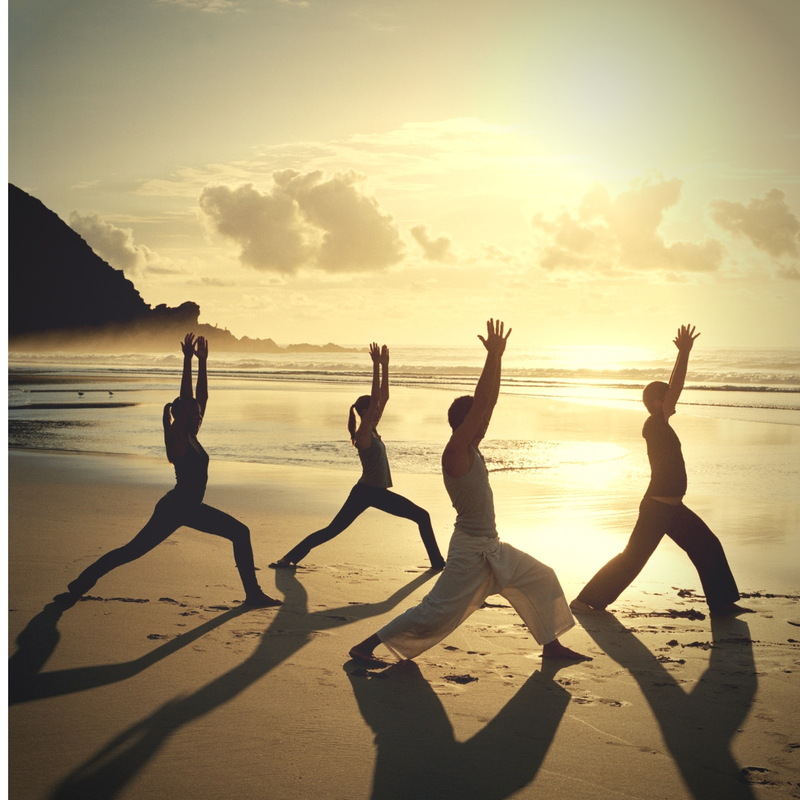 Our engaging and fun yoga sessions are not about sitting still! Discover basic yoga poses for focus, co-ordination, balance and flexibility, along with breathing techniques that can be used to manage emotion. You will learn to be present and feel empowered, have fun with partnered poses and yoga games and, at the end of each session, enjoy peaceful relaxation. Sessions are run by an experienced kids' yoga instructor with a background in teaching, and can be tailored to all ages - or choose from one of the themed sessions. 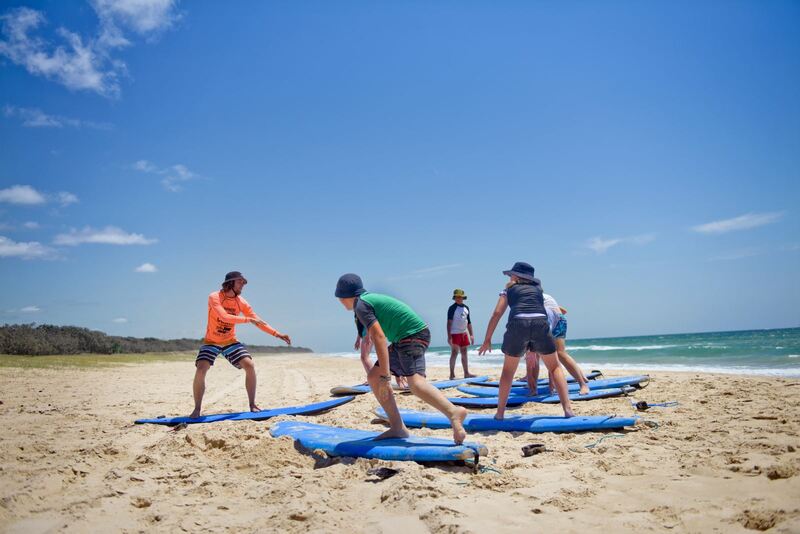 Always a favourite, this 'learn to surf' activity is designed to have everyone up catching waves, controlling their surf boards, paddling, standing up and riding the waves in to the shore. Conducted at North Shore beach, approximately 25-minute walk from camp. Note: This activity is not able to run on Mondays or weekends. *Participants must be able to swim. Best suited to ages 9 and up, however confident and/or tall 5-8 year olds are accommodated for. 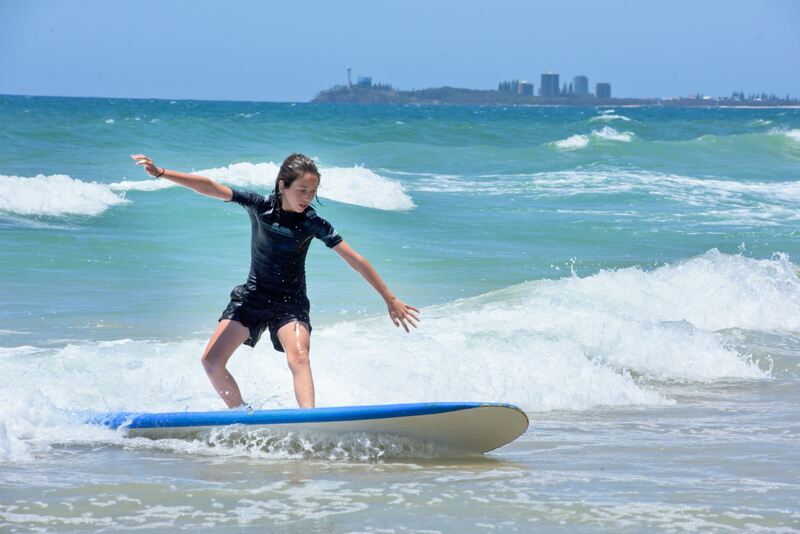 Body boarding is a great introduction to surf skills aimed at younger participants. Participants are taught how to catch waves and to control and steer their boards. Conducted at North Shore beach, approximately 25-minute walk from camp. 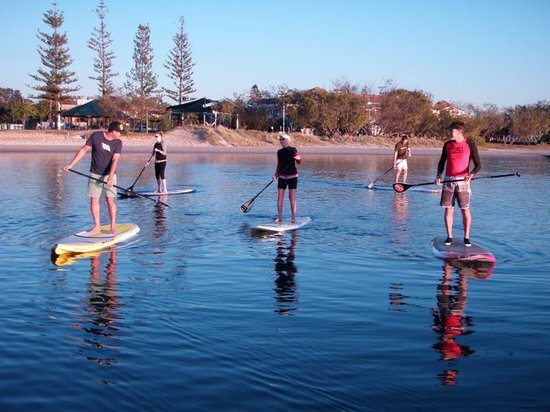 Our stand up paddle (SUP) boarding offers adventure and skill learning on the water, just nearby camp on the iconic Maroochy River. Standing full height on the latest SUP boards, large in size designed for ease of use, participants experience a real adventure. Note: This activity is not able to run on Fridays or weekends. *Participants must be able to swim. Best suited to ages 9 and up, however confident and/or tall 5-8 year olds are accommodated for as part of our School Holiday Program. 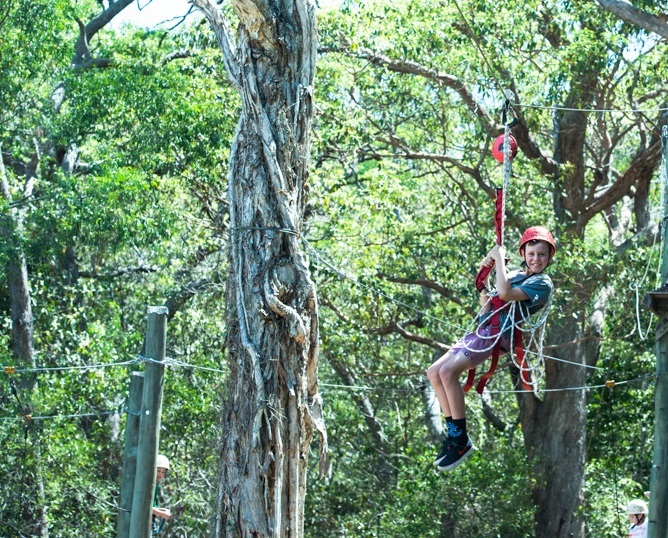 Challenge yourself on the latest in aerial adventure courses to hit the Sunshine Coast! 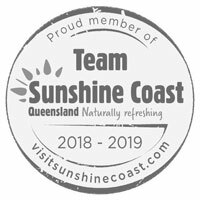 Participants can traverse the 10 and 14 metre high adventure courses, then launch themselves from the 12 metre high tower and race their mate on our thrilling twin 70 metre zip lines - the only twin flying foxes to be found on the Sunshine Coast! Participants also have the opportunity to 'skate' and 'surf' the skies on our legendary 'Sky Skater' and 'Sky Surfer', traversing the course on a skateboard and surfing from the high ropes course over to the top of the rockclimbing wall! Incorporating the most up-to-date technology, this course provides the best available personal safety system for participants by ensuring a constant connection to the overhead life lines. The revolutionary new belay system recognizes when a carabiner is clipped and closed on a safety cable, and will only then allow the other carabiner to be opened and transferred to the next element. 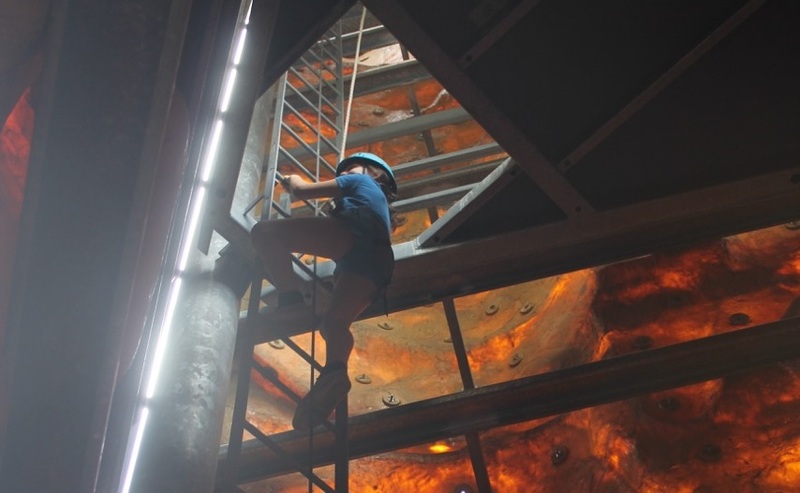 This activity is sure to challenge all of your senses while providing an awesome sense of achievement, all with unparalleled safety equipment. *Participants must be minimum 140cm tall. Best suited for ages 10 and up. Enjoy one of Australia's greatest traditions, a camp fire under the stars by our specially designed fire pit. Our staff will give kids an authentic campfire experience, with toasted marshmallows and interactive games. This is a great bonding activity that will have your group singing songs, having fun and winding down after a day of activities. For ages 11 and up, this activity may be combined with our red faces activity. Enjoy a supervised camp fire with all equipment supplied for your participants to make and bake damper alongside the coals of the fire. This iconic Australian dish is sure to provide the perfect treat at the end of the evening. Based on the popular game show, minute-to-win-it is a hilarious activity for the whole group and perfect for ages. Teams strive to complete challenges and games within the one minute time limit. This high energy and uplifting games night will have everyone in stitches! Relax under the stars and watch a movie on our large pop-up cinema screen while enjoying fresh popcorn (and ice blocks during summer). This is the perfect activity to unwind after a busy day of activities. Note: May be run as a whole group activity. We recommend wearing long sleeve tops, pants and insect repellent, and bringing towels to sit on. This activity may run as an indoor movie night, depending on weather conditions, mosquito/sand fly activity and preferences. The ideal team based activity where everyone can come together in a relaxed and fun environment. Let our facilitators entertain your group with fun and interactive trivia questions, and mini games in between. This activity is sure to keep everyone engaged. A whole group night activity with action aplenty! At night, the multipurpose court lights up and turns into an 'Olympic stadium'. Up to 140 participants compete in teams in a world-themed 'Olympic' event, with more than 14 challenges in order to win the title of the night: 'Olympic champions'. Using props and costumes, teams learn and perform skits and other fun acts that are scored by the judging panel. Laughter and fun group interaction is guaranteed! *Best suited for ages 11 and up. It's time to put on your flashiest clothes and hit the neon dance floor! Our large halls light up with laser shows and strobe lights, while groups take part in over 15 fun dance challenges. Please note, risk assessments for each activity are available here.